I’ve learnt not to expect much after detouring along the scruffy Sir Lowry’s Pass Village Road to avoid the traffic backlogs from Somerset West roadworks during the past year. But the entrance to Waterkloof winery might change that perception. I realised something was afoot travelling along a 2km vineyard-lined road that steadily inclines. Half way up, Waterkloof’s modern cement, steel and glass tri-level structure is perched dramatically at around 300m above sea level. It houses the working cellar, barrel area, wine tasting lounge and restaurant. There is minimalist designer furniture in the circular wine lounge, plus some colourful art. But it’s the dramatic views that draw the eye, thanks to 11m glass sheets stretching the length of the restaurant at Waterkloof from floor to ceiling. In views there’s a choice of Waterkloof vineyards on the Schaapenberg Hill to the left, or Gordon’s Bay towards False Bay straight ahead. Pretty spectacular stuff, and my tourist friends were impressed. With this sort of sensory preamble, French chef Gregory Czarnecki could serve up fish and chips and diners would be happy. Yet fortunately for the adventurous, his culinary ambitions extend a little higher than that. Czarnecki’s opening summer menu is full of risottos, Asian-inspired dishes and other classics with modern twists. His flatware is a cut above and the food looks pretty but is tasty too. 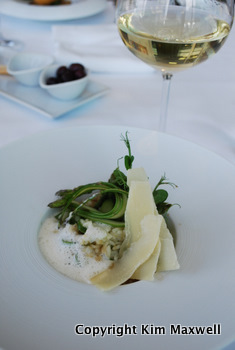 A vegetarian option of al dente asparagus risotto served with Parmesan foam and jus – beautifully prepared and tasty - or oyster mushrooms with rocket, given a dramatic touch from a crispy soft-boiled egg of deep-fried noodles. Of four starters ordered, only a shitake and squid tagliatelle dish was disappointing for the blandness of the squid. Roasted duck breast with coriander crust and a confit duck leg pastilla. To simplicity itself: subtle complementary flavour twists of Red Roman with fennel bulb confit on fennel puree with dill oil. Kudu loin sampled was overcooked and dry, served with eggplant caviar, roasted aubergine and jus with masala cream. But this sort of kink should easily be sorted out. Clever lemon meringue overtones of the deconstructed lime pie with almond crumble and tequila sorbet, to an eye-catching vanilla panna cotta with rhubarb marmalade and flavour accents in strawberry and basil foam. Notable features: It feels like you’re dining in a glass box and views from either the deck or behind glass are so spectacular that lunchtime would be my preferred option here. Wines are available in 750ml bottles. A nice touch is that each dish has a Waterkloof or Circumstance red or white by-the-glass suggestion. If your wallet is willing, the delicious Waterkloof Sauvignon Blanc 2008 is steep at R245, its high tag because the wine is sold out. Circumstance Sauvignon Blanc 2008 doesn’t offer the same tropical intensity-meets-minerality but it’s very drinkable at R108 per bottle, R30 per glass. Yes, menu prices are firmly in the fine dining category, but a three-courser won’t leave you hungry because this chef avoids “extremes with very little on the plate” because he reckons local customers are “a little scared” by tiny portions. By international standards, the consensus was that the restaurant offered exceptional value compared to what you’d pay for a similar experience overseas. 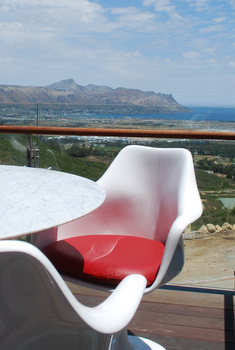 THE RESTAURANT AT WATERKLOOF, Sir Lowry’s Pass Village Road, Somerset West, Stellenbosch. 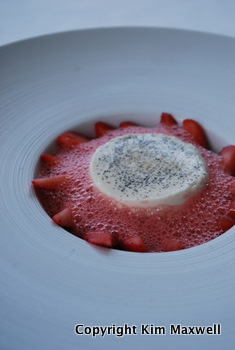 Tel 021 858 1491, http://www.waterkloofwines.co.za/ Open for lunch daily and for dinner Mon to Sat.